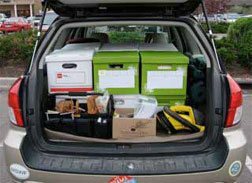 Car fully loaded with supplies for a working retreat. In addition to the back, all seats (except the driver's) are also packed full. 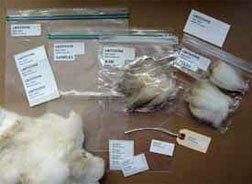 Hundreds of wool samples need to be washed separately and kept carefully labeled throughout processing. Labels! Everywhere! Always! On everything! The infinite varieties of fiber propel the work. 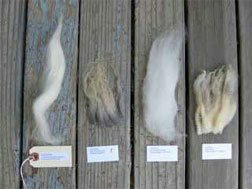 Deborah Robson edited Spin-Off for more than twelve years and collaborated with livestock expert Carol Ekarius to create The Fleece and Fiber Sourcebook: More than 200 Fibers from Animal to Spun Yarn (Storey Publishing, 2011). Now that her amazing book is finished, she is focusing her time on related workshops. We have invited her here to share with you what she learned a person might need to complete such a project. Persistent longing. For something the other books have not given you. Experience I. Enough to begin the job. Saws, crowbar, nails, molding, and a friend's husband. The friend, an organizer who has bailed you out of previous bouts of disorder, observes that your jam-packed bedroom office can't accommodate even a minuscule additional project, which the proposed book, even in its initial, comprehensible form, is not. She envisions breaking into the adjacent storage room, which will provide more floor space (to hold, for example, a spinning wheel, a chair, and wool-drying racks). It will also free up the short hallway, the normal access path to this room, to store piled boxes of fiber (there is no other place for them: the downstairs bathroom in its entirety is also ultimately called into service). You remove the wall of bookshelves (where to put the books?—a question never resolved, but not essential to progress: stacked, they quietly wait), clear the eight-foot span, and watch as her kind and skilled husband cuts a large hole and then finishes it neatly. Note that sunshine now comes into your working space from two directions. Breathe. Boxes. Cardboard file boxes. Many. Zipperlock plastic bags. 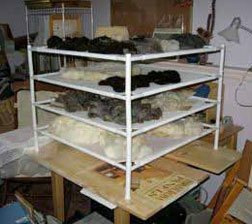 You never store fiber in plastic, but with fibers coming into the house from random sources throughout the world, plastic is safe and maintains order. Oops, ran out again. Spinning wheel. Reliable, versatile, and easy to pack for transport to work sites. Of a type for which you can obtain spare parts as they wear out. Augment with a box of processing and spinning aids: combs, carders, flicker, diz, nøstepinne, lazy kate, extra bobbins, oil can, hand cream, spritzer. A touch of insanity. Enough to believe the job is possible. Enough to believe you can do it. Enough to believe that the rest of your life will not come crashing down around you during the project, or shortly after it's finished (all else having been held in temporary abeyance by the project-generated force field). Yoga and meditation. To keep muscles from seizing up and mind from freaking out. Experience II. Having both written and edited massive works before, although not like this one, you know that survival is possible, even at times when it seems improbable. Support. Shipments of fiber, unexpected checks, companionship, digital photos, meals, PDFs, and encouragement, from family near and far, friends close and peripheral, librarians (especially the Interlibrary Loan coordinator), and strangers you would love to meet. Computer, with software made for organizing and writing a complex manuscript. Shift from PC to Linux to Mac. Discover Scrivener software! and get toehold on sanity. Dedicated teamwork. Without faltering, from everyone directly involved in making the book happen: collaborator (instigator: it's all her fault), editors (guiding, managing, and photo), publisher, art director, photographer, prepress specialists, and administrative facilitators of travel, reimbursement, and other essentials. The gift of solitude. Arranged by friends, a week in a cottage a day's drive from home, where you dig into and clarify the Dorsets and where you also figure out, with pencil and graph paper, how to make sense of conflicting data about fiber qualities. Other scattered weeks throughout the nearly four years offer concentrated time for resolving other thorny matters. Some prickly concerns, like the Cheviots' last-minute crisis, must, of course, be resolved in the middle of normal life. But the weeks away become calm harbors between stormy passages. Breathe. Reliable parcel delivery service. To transport samples, proofing pages, maps-in-progress, and, finally, the completed production files to the printer. Samples: boxes lost in transit. Not forever. Breathe. Love. For the fibers, the animals (especially the sheep), and the community of spinners, knitters, weavers, crocheters, lacers, luceters, and others. Mix well to produce a gift: For us all, including you. Now: What were you doing four years ago, which this proposed nine-month project, of much smaller initial scope, interrupted? Breathe. And spin. You'll figure it out.